Yo Dawg, Is That Randy Jackson Doing The Truffle Shuffle Or Me Shaking Off My Indecisiveness? If I had to describe my dancing ability I’d say it’s borderline smooth and graceful. Jenn, on the other hand, uses words like spastic and convulsive to explain the movements that take place once my feet hit the dance floor. Having watched myself moonwalk in my bedroom mirror since I was 10 years old, I dismiss what she says as silly talk. I know there is soul somewhere deep down inside me. Granted, it has yet to show up when I bust out the Running Man, Funky Chicken or Robot, but I know all of the time I have spent watching and studying Randy Jackson’s Presents America’s Best Dance Crew will eventually pay off. Even after tuning in to numerous episodes, there is one thing that still leaves me puzzled: why is the big guy’s name attached to show anyway? Mr. Dog Pound doesn’t strike me as being someone who is nimble on their feet. 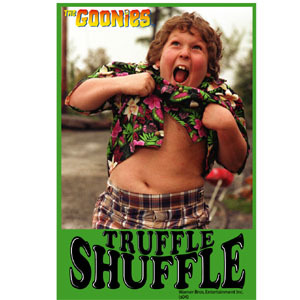 I believe the only dance move that wouldn’t cause me to test my gag reflex is if Randy were to ever reenact Chunk doing the “Truffle Shuffle” from the movie Goonies. I am pretty sure I would actually pay to see that take place. I realize those are some pretty harsh words considering they are coming from a man who has two left feet. Part of me has embraced my lack of rhythm. My skills, or lack thereof, always causes my two little girls to chuckle when we have our weekly family dance party and that is good enough for me. Paige will point to the “I-Poo” and request the “Yeah-Yeah-Yeah” song. Knowing this might cause some of you to question my parenting skills, the tune she is requesting is actually Duffy’s “Mercy.” Considering I just divulged that little nugget of information, I guess I should feel comfortable enough to let you know that some of her other favorites include Gwen Stefani’s “Hollaback Girl” and “Canned Heat” by Jamiroquai. Don’t worry neither girl is really listening to lyrics of the songs, they are completely mesmerized by their daddy’s arms and legs thrashing to and fro wondering if he is dancing or having an epileptic seizure. The moments where I regret not knowing how to two-step or waltz is when Jenn and I go to a wedding. Sitting on the sidelines eating my weight in free filet mignon while others cut a rug on the dance floor is not Jenn’s idea of a fun evening out. On numerous occasions, she has brought up the idea of taking a dance class together. The closest I’ve come to lessons is freshmen year of college when I filled one of my physical education credit requirements through square dancing, but I am pretty sure this doesn’t count. I could use the excuse that lessons would be another expense for our shoestring budget or yet another activity to fit into our busy schedule, but those are not the source of my hesitation. The reluctance stems from knowing I might misstep, trip over my own feet or cause Jenn to ice her feet after every class due to my clumsiness. One way you can tell a professional dancer from an awkward and uncoordinated novice like myself is where their eyes go when they misstep. It is inevitable to find yourself offbeat at one time or another, no matter how many times you’ve taken to the dance floor. While the pro looks towards their partner to find their rhythm together, the inexperienced dancer tends to look down at his or her feet. When this happens, moves become choppy, forced and the center of the dancer’s attention. Many of my movements over the last 7 years have been more than choppy. They have felt down right unnatural. I find myself wondering if this is the step I should be taking. Almost every decision I’ve made has been second-guessed and plagued with doubt. The funny thing is there was a time in my life when I was confident in the choices I made regardless if they were wise or completely off course. However, after the experience I had with my first job after college, everything seemed to change. A little background information for newcomers to this blog to get you caught up to speed. With my college diploma in Christian Ministries in hand, this idealist dreamer was ready to transform a younger generation for God as a youth pastor. I had no doubt in my mind that this is what I was called to do with my life. Yet, no textbook or lecture prepared me for what I encountered at the church. Things that were thrown my way seemed to set me up for automatic failure. I felt hopeless and alone. Coming home almost every evening defeated put a strain on my relationship with my beautiful new bride, Jenn, as we were fulfilling roles no spouse should. For the sanity of our marriage, and ourselves, we knew I had to hand in my resignation and move on. The problem was neither of us had an answer to the important question of: move on to what? My state of mind at the time was cynical, bitter and confused. I did not know how to rectify the fact that I had told God I would go anywhere for Him and the first place He sent me seemed to be the dark wilderness. It made me doubt if I had completely mistaken God’s calling on my life and if that was the case wondering where that left me. Was it the situation or myself that caused my first experience into ministry to be unsuccessful? Not wanting to venture into another youth ministry position, have it fail and ultimately realize it was me all along; I gave myself a year to figure things out. Instead of going forward, I decided to remain in neutral. Having no children or responsibilities at the time, Jenn and I decided to move down to Wilmington, NC. I could over spiritualize it and say ‘we felt this was where the Lord was leading us,’ but that would be a bold face lie. We packed our bags and headed south towards the beach based off a survey we filled out on a website called FindYourSpot.com. Jenn got a job working retail while I got my dream job (note the sarcasm) filling out spreadsheets for corporate America. Sitting in my cubicle filling out TPS reports is where my tendency towards indecisiveness originated. Day after day I wrestled with contentment and questioning every decision that came my way. As odd as it might sound to some, being unsure of my abilities, passion and vision as it related to my job left me paralyzed with the fear of making another wrong decision not only in regards to employment, but in every aspect of my life. Eventually, I grew tired of living life staring at my feet and not focusing on what was ahead of me. This shift in perspective took place only when I became willing to take the diffciult, yet necessary steps, in examining my time at Ashton as a youth pastor. It wasn’t until I could see how my character was shaped and formed during the process that I realized there was a purpose for going through what I did. In the midst of everything I perceived as a failure, God still moved in the lives of young people I influenced. While journaling all my thoughts down on paper, something else interesting happened. I began to fall in love with writing all over again. I guess it wasn’t Randy Jackson doing the Truffle Shuffle after all, but me who found a way to shake off my indecisiveness. Hopefully, once these 30 days are over I’ll samba my way out of second-guessing for good.